Warehouse & Head Ofﬁce 48 Overseas Drive, Noble Park North, VIC 3174 Ph: 03 9890 1867 Fax: 03 9898 6527 Mon—Fri: 8.30am—5.00pm Our warehouse & head ofﬁce are located in Noble Park North. Our Customer Service Centre is located in Box Hill North (Melbourne) for direct shopping & browsing. Unfortunately that facility is not available at Noble Park North. 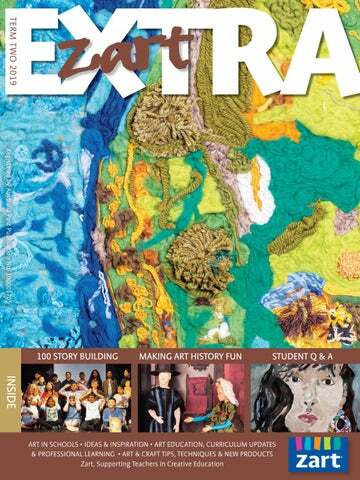 Postal Address: PO Box 1198, Waverley Gardens VIC 3170 Zart Extra: ISSN 448–8450 Zart Extra is published quarterly by Zart Education, a division of Zart Art Pty Ltd ABN 24 621 120 321. This publication is mailed prior to the first week of the term issue date. This newsletter allows art teachers/ co-ordinators to learn about what is happening in art education and what other art teachers are doing. You will ﬁnd information on new art techniques and processes, the latest materials and resources on the market. Please note, all prices quoted are valid for the duration of the current term only and are subject to change without notice. The insert of the newsletter provides details of our term's workshops, so teachers can then contact us and book into the workshop. 100 Story Building Project A unique publishing program for children 100 Story Building is a centre for young writers in Melbourne, using the writing, telling and making of stories as a tool to foster creativity and imagination. It doesn’t happen very often to the Australian Children’s Laureate, Morris Gleitzman, but late last year, Gleitzman found his work being assessed as ‘ﬁt to print’ by a group of young editors, aged 10–12. Gleitzman was participating in 100 Story Building’s unique publishing program, Early Harvest. This program brings together a group of young editors in Year 5 and 6 to publish the annual children’s ﬁction publication Early Harvest which includes contributions by young writers and famous children’s authors. Each year, 100 Story Building enlists schools in areas of high need to participate in the program. Next an editorial board of young editors is selected. Under the mentorship of publishing professionals – editors, illustrators, designers and published authors – the students send out a call for submissions, commission illustrations, decide the cover, interact with designers and put the magazine together. For Early Harvest 7, six schools from Greater Dandenong participated in the program. The editorial board of 14 young editors selected ‘Dreams’ as the theme. The young editors received 150 submissions from young writers. Just as they were ﬁnishing, a surprise 151st submission arrived from none other than best-selling author and Australian Children’s Laureate Morris Gleitzman. Not ones to get celebrity-struck, the editors applied the same stringent criteria they applied to the children’s stories. Luckily for Morris, he made the cut but not before some careful consideration, discussion, feedback and edits! In the past, best-selling children’s authors such as Andy Grifﬁths, Terry Denton, Shaun Tan, Sally Rippin, Alice Pung, Maxine Beneba Clarke and more have participated in the program. Teachers have found the magazine a very useful tool to encourage reading in class. about planning for the project and learning about the design process. I rushed off to “Savers” for bundles of budget-friendly, bagged-up Barbie dolls while the students started planning a materials list of what they thought they might need to complete the task using art room supplies and found/recycled objects. I asked students to trial colour samples and match them to the original artwork. This was supported by teaching some colour theory using complementary colours to darken bright primary and secondary colours. I also taught ﬁne brush control and asked then to think about how they might replicate the textures in the work and make a list eg: woodgrain, foliage etc... This was a great chance to explicitly teach aesthetics, analysis and critical and creative thinking. The students had heaps of fun and were engaged throughout the entire unit of work. Their understanding of the artist’s intent, the aesthetics and the historical and cultural context of the works was enhanced by spending so much time scrutinising the small details. As a teacher, I thoroughly enjoyed this unit even though I was on my feet the whole time gathering scissors, glue guns etc.! The Barbie project was fun, offered many opportunities for rich conversations with students, and was satisfying to see their results and their sense of pride in the works themselves. 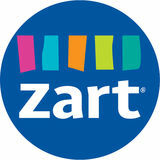 A big thank you to Lou Chamberlin and Zart for inspiring me to launch this great unit! Making Art History Fun with Lou Chamberlin on June 20 2019, please refer to page 12 of the PL Workshop Insert. Image coutesy of Lou Chamberlin. Zart Education accepts submissions for the Student Gallery all year round in advance of the exhibition dates. To submit an application to exhibit one of our term gallery displays, please forward images of artwork and a brief description of works to zes@zartart.com.au for consideration by our Gallery Curator, or contact Colleen on (03) 9890 1867 for more information. At the beginning of every term a new exhibition is curated and celebrated with an ofﬁcial ‘opening afternoon’ event for young artists, teachers, families and art lovers. Openings are hosted by Zart Education and give platform to the ideas, technical skill and hard work of our young Victorian artists. Events offer light catering, a ‘gallery tour’ of the exhibition, interviews with the young artists, and a raising of glasses/cups of cordial. I do not think that art is innate in some and not in others. I simply believe that we are all born with the desire to create beauty, however, I merely think that some, whether they choose it or not, simply outgrow this. I was lucky. I did not. Or maybe I did and forced it back into myself because, as I learnt early on, I cannot survive without it. who painstakingly strived for meaningful recognition. And, although I was shy, I was always jealous of how easily people could create ‘art’ and the attention that they received as a result of this. For me now, art isn’t about the want to be appreciated, but is merely my only true form of communication. And, like a disease, it has spread from my brain to my hands, to my mouth, to my thoughts, into every action I commit, altruistic or not. I am all consumed by it. It is my job, I believe, on this earth, this corrupted pile of dirt, to provide beauty for those who struggle to ﬁnd it themselves. And I cannot be more content. What's that Plastic? Clear plastic ﬁlms are often generically labelled as Acetate, but not all plastics are the same and they have different purposes and advantages in the artroom. Here, we look at three clear plastics that are often confused with each other: Acetate, Dura-Lar and Wet Media Polyester Film. Acetate A clear general-purpose cellulose ﬁlm made from cotton linters and wood pulp. Usually biodegradable and can be recycled. 3. General purpose plastic for art & craft projects. 1. Clear transparency, ideal for planning painting or collage compositions in layers – simply hold the Dura-Lar drawing up against artwork to check object placement. 2. Create skins of acrylic paint mixed with Pouring Medium, which could be used for collage once dry. Dura-Lar Wet Media Film This clear polyester ﬁlm combines the features of Mylar and Acetate. This ﬁlm does not tear or crack, which makes it ideal for creating stencils. Specially treated on both sides, it is a great painting and drawing surface for water-based mediums, markers, inks and airbrushing – no beading, chipping or running! Film can be reused – simply wipe with a damp cloth. 3. Great for construction, architectural models or abstract sculptures – simply cut, score and fold! 4. Can be moulded in hot water (steaming but not boiling – use gloves). Immediately hardens into moulded shape when removed from water. Colour with Yoken Markers once dry. Wet Media Polyester Film Clear polyester ﬁlm that is specially treated on both sides to accept drawing and wet media such as gouache, ink and acrylic paint, as well as markers and ﬁneliner pens – no bleeding or beading. 1. Use as an overlay for drawing and designs. Write annotations on the overlay. Great for VCD students. 2. Ideal for planning painting or collage compositions in layers. 3. Draw a variety of outﬁts and layer them up over a ﬁgure drawing or fashion croqui. These layers can be photocopied together in a mix-and-match fashion. This minimises the need to re-draw the ﬁgure repeatedly. Working with Watercolour Watercolour paint is applied with a brush onto paper and remains soluble to water and permeable to touch over time. It’s more transparent and thinner compared with other water-based paints such as gouache and acrylic. Opacity naturally varies across colours. The pigment’s natural properties determine whether the paint is transparent, semitransparent or opaque. Transparent colours are often used for glazing and allow the light to transfer through the paint and reﬂect off the paper, which improves colour vibrancy. Some colours have greater pigment strength, so less paint is required on the brush, especially when mixing colours. E.g., mixing a midorange requires less red than yellow. Staining pigments are difﬁcult to lift off the paper, whereas nonstaining pigments can be more easily removed by re-wetting the paper and lifting the colour off. Granulation As watercolours are made from ground up pigment, they react to water and the paper surface in unique ways. Non-granulating pigments react smoothly and evenly with water and provide uniform coverage with little variation in texture. Ideal for rendering solid man-made surfaces. Granulating pigments separate from the binder when mixed with water. Pigment settles in the valleys of the paper, leaving a grainy texture. This is more obvious on highly textured (rough) paper. These effects are desired when painting foggy skies, hazy landscapes and beach waves. The more water used, the more intense the granulation effect. This granulating tendency creates interesting effects when colours are mixed. What’s the Difference Between Artist or Student Quality? Artist Watercolours: Made from pure and quality pigments with high permanence and vibrancy. Very high pigment content in paint formula, which provides clean colour mixes and strong tints. Colours are often rated for permanence and lightfastness. Priced higher than student quality paints. Student Watercolours: Consist of modern, man-made, non-toxic pigments, which vary in lightfastness. Pigments are not as pure or saturated as artist quality, which can affect their ability to mix cleanly and deliver (or retain) vibrancy. Typically, student paints are made using more binder and less pigment, which results in a chalky, opaque ﬁnish. Limited colour palette. What’s the Difference? Watercolour Tubes & Pans Unveiled Pigments are ground and stone milled together with water and a binder called Gum Arabic, which enables the pigment to sit on the paper surface. This mixture is then either transferred into paint tubes at the consistency of toothpaste or poured directly into paint trays to form hard discs. • Toothpaste consistency. • Can be used straight from the tube without adding any additional water to achieve maximum colour intensity and coverage. • Ideal for mixing large batches of paint. • Preparation and pack up time is required for squeezing out paints and cleaning palettes. • Often there is paint wastage as it can be difﬁcult to determine how much you need. Some pigments left to dry on the palette can be reworked but can be difﬁcult as paint loses its colour intensity and may appear grainy. • Tubes are less convenient to transport. • If caps are not replaced correctly, they will get stuck and paints will dry out. • Often colour mixing is required. Pans or Discs • Pans are dry and ﬁrm blocks of colour. • Compact, portable, durable and easy to store. • No preparation time required. • Minimal mess and less wastage – only use what you need then leave to dry and ready for next use. • Tends to last longer in the artroom, making them less expensive than tubes. • More difﬁcult to mix large volumes of paint, especially if thick mixes are required. • Pans are rougher on the brush bristles, which may shorten the brush life. • Easier to share in group settings such as the artroom. • Lid acts as a mixing palette, which can easily be wiped clean with a wet cloth. • Easier to see all the colours on working palette. • Colours can be lightly sprayed with water before use to improve workability. • Wider selection of nuanced colours, which are ready to use. Not as ideal for pure colour mixing as colours are created from multiple pigments. • Possible to pick up a lot of colour for highly saturated coverage, or to dilute the colours by picking up a small amount of colour on a wet brush. Nurturing Creativity Inspiration | Information | Art Practice Bringing together visual arts educators from across Australia for a day of professional learning. Teachers will have the opportunity to network with colleagues & connect with organisations that offer a range of support & expertise. Experience & learn through a range of practical & theoretical workshops which will inspire & motivate creative outcomes. This day will suit both primary & secondary visual arts teachers.